As far as I’m concerned, YÜLI’s Halcyon Cleanser is magic. The first time I used this, I made the mistake of having too wet hands and a too wet face. The result: I felt like I was massaging a very pleasantly-smelling water over my face. Use this with a damp face and/or lightly wet hands, key words: damp or lightly wet, not dripping. This way, you’ll get the gentlest foaming action you’ve ever seen from a gel–and yet it’s powerful enough to dislodge whiteheads that are ready to go. Was that too visual? #sorrynotsorry. But time and time after again, when I’m breaking out, I go back to this one, because it’s gentle, leaves my face the softest, and combined with a light massage, somehow clears out surface acne–be it instantaneously or gradually over time. It’s the best and strangest thing ever. Also, the light, floral scent is so refreshing day or night. And like all YÜLI products, it’s a product of the ingredients which were chosen for efficacy, not for scent (#coolwithouttrying). With such a gentle formula, you wouldn’t expect it to be able to remove makeup, but it can. YÜLI has a blog post demonstration of how Halcyon can remove makeup; I’ve tried it, and it works. One reader I talked to once said that she even uses this to remove eye makeup, which I also tried with some success (though fair warning, the instructions say to avoid the eye area). The reasons why I don’t use it to remove makeup are because I feel more comfortable removing my makeup with a balm or oil cleanser first and I want to make the most out of these beautiful ingredients. The plus side of using this as a second cleanse is that I can be rest assured that if my first cleanse didn’t get all my makeup, this will mop up. At night, I typically use three pumps (a little extra just in case for makeup) after a balm or oil cleanser, and in the morning, two, alone–and my skin has loved this from last fall up until now as the flowers are finally coming out for spring. Amazing performance aside, just from the ingredients, you know this cleanser is something special. I’m thinking the floral scent and part of the gentleness come from the hydrosol blend, herbal infusion, and aloe which all top the list. As Mountain Rose Herbs puts it, a hydrosol contains all of the essence of the plant in every drop, just like essential oils but in milder form. In vitro studies have proven helichrysum italicum to be anti-inflammatory and antimicrobial, and many, many studies have been done on lavandula angustifolia (fancy for lavender) on its antimicrobial powers and calming effects (and all of these properties are in every drop of the hydrosol!). The herbal infusion of green tea leaf, red algae, chickweed, and sweet olive flower together are antimicrobial, cooling and drawing, and full of antioxidants and minerals. Other cool ingredients include peptides, zeolite, vitamin C ester, and biodynamic fruit enzymes. While many other cleansers use sulfates (goodness forbid) or castile soap for foaming action, here the peptides derived from Amaranth protein are the source of the very gentle foaming action that washes away nasties from your skin that also, being peptides, help to heal and repair the skin. Friendliest foaming ever? Zeolite is this weird clay that absorbs nasties (just don’t inhale it as a powder–cancer warnings), vitamin C ester is a very skin-friendly form of vitamin C (hey brightening), and fruit enzymes mean gentle exfoliation. All in all, a really special and different list of ingredients that together clean and heal the skin. tl;dr There’s a reason why Kathy of Beauty Palette has multiples of this on backup–it’s good. Gentlest foaming action, light floral scent, soft and clearer skin afterwards (literally can massage away surface whiteheads). Can remove makeup, but I prefer it as a second cleanse. Unique ingredients: foaming peptides and hydrosol blend. Have you used this cleanser? What are your thoughts? If not, what is your current favorite cleanser? Disclaimer: I purchased the 100ml size myself and the 30ml size was a sample-with-order with a separate order–both from yuliskincare.com (though now you can find it at Spirit Beauty Lounge!). I know I have a lot of love for this brand and its products, but honest to goodness, all thoughts and opinions are my own. Herold, Lauren. “Chickweed: A Stellar Herb.” Journal Of The American Herbalists Guild 10.1 (2011): 31-33. CINAHL Plus with Full Text. Web. 3 May 2014. Hsin-Hsueh, Lee, Lin Chi-Ting, and Yang Ling-Ling. “Neuroprotection And Free Radical Scavenging Effects Of Osmanthus Fragrans.” Journal Of Biomedical Science 14.6 (2007): 819-827. Academic Search Complete. Web. 3 May 2014. Viegas, Daniel Antunes, et al. Helichrysum italicum: From traditional use to scientific data, Journal of Ethnopharmacology, Volume 151, Issue 1, 10 January 2014, Pages 54-65, ISSN 0378-8741, http://dx.doi.org/10.1016/j.jep.2013.11.005. Vlaisavljevic, Sanja, et al. “Trifolium Pratense L. As A Potential Natural Antioxidant.” Molecules 19.1 (2014): 713-725. Academic Search Complete. Web. 3 May 2014. Very thorough review. I love gentle cleansers! This one seems lovely. Just discovered your blog and been loving all your product reviews. I was always a oil cleanser or cleansing milk girl myself, but my facialist said it made my pores more clogged and didn't clean as well so when I heard Yuli was making a cleansing gel that was an answer that I was looking for. And I so agree, very very gentle and light but effective. I also do oil cleansing first which is my makeup remover step so that the peptides and all those fancy ingredients in Halcyon can get in my skin. It has really added a glow to my skin and I love it! Hello, nice review miss! Would love to know the exact name of the peptides extracted from Amaranth grains :-). I usually steer clear of gel cleansers, but this one has me intrigued. Sounds great! I can't wait to try this + Harmony. Getting through some of my other cleansers right now before I take the plunge. I'm currently using one from Luminance Skincare that I really like. It has a castile soap base, which sometimes can bother me, but this one is just fine. I like the Yuli's cleanser has a protein-derived foam; so interesting! Thanks for such a thorough review … can't wait to try this! I started off using oil cleansers too, but similarly, my pores weren't too happy when I used them alone. When I use an oil cleanser and YÜLI, my skin is so happy. Happy you love Halcyon too! Can't wait to hear what you think about this one and Harmony! I had a little sample of Harmony that was really nice–but I need to get through my other body oils until I plunge for it. Never heard of Luminance Skincare–will check it out. I remember Dr. Alkaitis' cleanser also had a castile soap base, but that one's foaming was also gentle so it wasn't bad, but it was not as gentle as this one. I love the protein-derived foam–too cool! Thank you for the love! Great review! I'm really interested in this cleanser. I love that its gentle yet really works. Hi i like Halcyon too, but sadly find it a bit stripping and drying. I love this cleanser too! It really is magic and credit where it is due it works without drying my skin. I use 3 pumps each time and the gel disappears into my skin while it takes everything off. I even did a cotton round test and this got my skin so clean compared to others. Best part is that my skin isn't tight, perfect amount of moisture. I've been using all sorts of green cleansers, OLO Oil cleanser, de Mamiel balm they do a good job of removing makeup but never make my skin feel clean. I think there is something green cleansers don't use that actually cleans deep down but Halcyon looks good and I wanted to check with you if it goes beyond the surface before I bought it. Thank you! I'm with you, sister! I'm a bit dry-ish and definitely blemish-y, but I also get really sweaty. Halcyon works great for all of these for me. I definitely can't use oil balms alone (haven't used enough milk cleansers to say the same), but when I use one of those together with Halcyon = happy skin! So happy Halcyon has worked so well for you–hope those cystic zits clear up soon and thanks for sharing your story! Hi Laura, sorry to hear Halcyon is stripping and drying for you (if you were one of the commenters on Neimans Idealist's review of Halcyon, I remember you). If you don't mind me asking, what kind of skin do you have? Mine tends on the drier side, especially during the winter, and my skin always felt soft and plump afterwards. Then again, I always cleansed beforehand with an oil cleanser, so that may have helped. I should also add that with all cleansers, I can only last a couple minutes afterwards before I start feeling dry and feel desperate for moisturizer. But I usually moisturize straight after cleansing to avoid this. 😀 I'm so glad to hear you love it too and love that you also did a cotton round test–nice! *high five! Yessssssss I love that video! Heh, I also did the swimming and upward cleansing motions with Halcyon–you're right, it is THE cleanser for that! Also have you seen the recent one on face massage? I've been doing that with my oil cleanser lately and it feels so good. I can't say enough good things about this cleanser, it not only tames my skin but befriends it. Seriously, it is SO GOOD for my skin. My pores look smaller and my skin just appears to be at happy contentment. I know this line isn't hyped by the green blogs, but they're pretty special! Such a great review, Yuli's Halcyon's definitely the next cleanser I'm going to be trying once I get through my other three. Working through a breakout (around my nose) of late thanks to a bout of the flu, but I'm almost through with it. Cell Perfecto's really going doing some good fading them scars. Yes I have seen Laura comment too on almost every Yuli review saying their cleanser is too stripping and drying. My skin is also on the dry side (in fact some mornings it gets a little ashy if I don't moisturizer fast enough). Halcyon always made me skin feel nice and soft after, never stripped. Sometimes I wash my skin with just water to let it go without any product and I have to say, Halcyon is more moisturizing than washing with just water so I really cannot say it is a stripping or drying product at all. Like you said.. I always moisturize quickly after cleansing too because I want my cleanser to cleanse.. not really to moisturize which is a separate set of products. Hello, no I have not commented on neimansidealist. (I think a Lara commented there rather than me, Laura :)). I have dry skin. I might try oil cleansing first as I want it to work and am generally a big yuli fan. Great tip; thanks. You're right, sorry about the mixup! Hope you give oil cleansing a try–I can't do without it now! 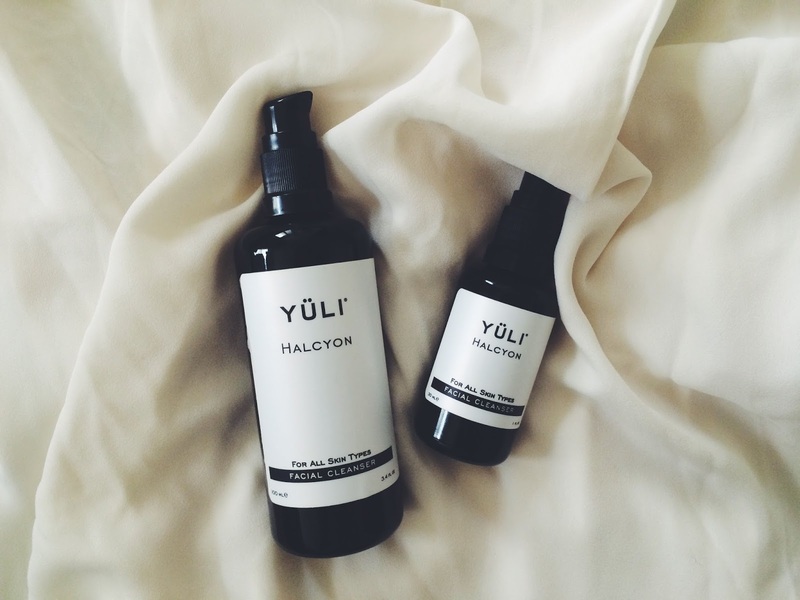 I just ordered my first Yuli products a few days ag–it included the Halycyon cleanser, both the Cocoon Elixir and Pancinea (spelling oops?) elixir, the Liquid Courage and the lip serum so I will definitely post as soon as I try this line which I am BEYOND excited to try—look every day for my package!!! Everything looks so fantastic–I currently use May Lindstrom the problem solver and clean dirt which I adore and One Love Organics cleanser—I have been hearing such rave reviews, one after the other regarding the efficacy of Yuli so I splurged:)) cant wait!!!! !